Gigabyte has released its CMT4032 and CMT4034 M.2 x16 PCIe add-in-cards, which are two daughter-boards that can be equipped with up to four M.2 SSDs. While the CMT4032 is compatible with two M.2 SSDs, the CMT4034 can be equipped with four drives. Both cards are compatible with M.2 22110 SSDs. The PCB sports up to four M.2 sockets without a power connector. It's not the first time that we see a PCIe add-in-card compatible with up to four M.2 SSDs. 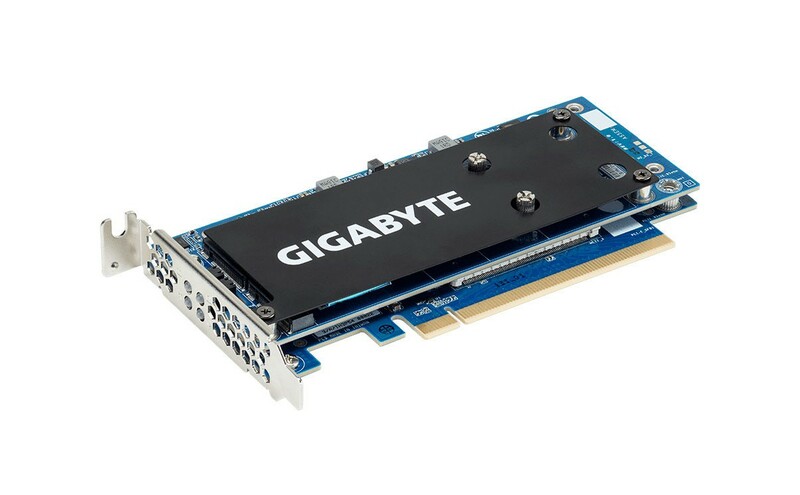 Compared to the ASUS and ASRock cards, the Gigabyte CMT4034 looks a bit smaller. Furthermore the M.2 sockets are placed rather close to each other. According to the pictures, the CMT4034 should be compatible with four M.2 SSDs with up to 110mm length, two for each side. While the CMT4034 takes a PCI-Express 3.0 x16 slot, the CMT4032 requires a x8 wiring. Both cards come with a metal heatspreader with Gigabyte logo. Furthermore you will get thermal sensors and few activity LEDs for each slot.